He is one of the main important "ancestors" of haikai.
. Sennenji 専念寺 Sennen-Ji .
. Memorial Days of Haiku Poets . 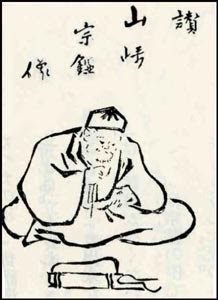 A renga and haikai poet from Ōmi Province, Japan. His real name was Shina Norishige, and he was also called Yasaburō; "Yamazaki Sōkan" was a pen-name (haimyō). Inu-tsukuba-shū (犬筑波集), another important anthology of renga and haikai poems. His unrefined style came to be quite influential, and inspired the development of the danrin style of poetry which emerged fully in the early 17th century. Sōkan died in 1553, after gaining a degree of fame and wealth for his poetry and calligraphy.
. Saho Hime and Spring . 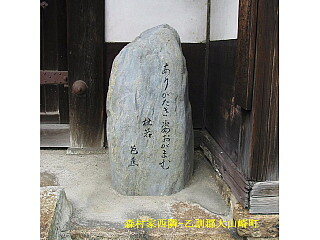 He lived there in great poverty.
. kannazuki, kaminazuki 神無月 the gods are absent . 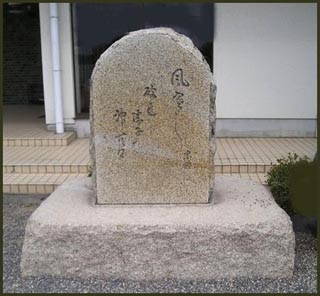 Matsuo Basho visited the remains of his home in Oyamazaki, Kyoto 京都乙訓郡大山崎 during his travels in the summer of 1688 貞亨5年夏. they are "Hungry Demon Iris"
This is a pun with KAKI and GAKI.
. WKD : gaki 餓鬼 the "Hungry Demons" .